…with special tips for international students at US colleges. 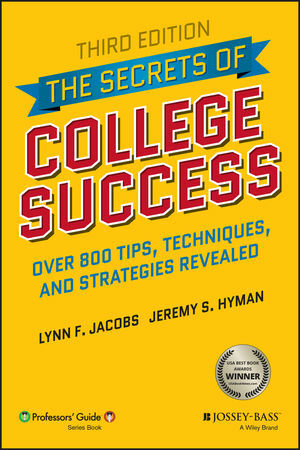 Winner of the 2010 USA Book News Award for best book in the college category, The Secrets of College Success makes a wonderful back-to-college or high-school-graduation gift –or a smart investment in your own college success. LYNN F. JACOBS and JEREMY S. HYMAN are college professors with a combined 50-plus years of teaching experience at eight different colleges, including the University of Arkansas, MIT, Princeton, UCLA, Vanderbilt University, and California State University, Northridge. They maintain a website at www.professorsguide.com, blog for U.S. News & World Report, and have contributed to blogs at The New York Times, Chegg, and Reader's Digest. 2 In The Beginning . . .
8 In Case of Emergency . . .